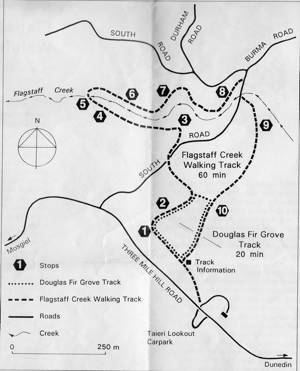 Planting commenced at Flagstaff Forest in 1906, with introduced trees of a wide variety and type. By 1914 22 different species had been tried, many of them deciduous trees from Britain. These species were unable to compete with weed growth and a switch to evergreen pines was undertaken. Planting from then on was concentrated on the use of Radiata pine, Ponderosa pine, Douglas fir and Larch with a scattering of Spruce in the wetter gullies. Following WWI there were a number of returned servicemen in need of rehabilitation work and these in the main provided the labour force. During the depression in the 1930s the city made considerable progress in forestry with an ample labour force. Clearfelling of the first crop commenced at Flagstaff in 1934. Local log sales required approximately 10 hectares per annum to be clear-felled. Two export log trials were undertaken, one in 1959 and the other in 1962. Export logging on a regular basis commenced in 1969 and continued at a volume of approximately 100,000 cubic metres annually. This reduced to approximately 14,000 cubic metres as a result of the lack of planting between 1940 and 1969. Export logs were sold to Korean, Japanese and Chinese buyers. With the income and confidence generated by earlier sales the council in 1970 decided to expand its forest estate. Following that decision it added several thousand more hectares making a gross forested estate of 10,000 hectares. We have a current planting programme of 350 hectares per annum. The replantings and new plantings are in Radiata pine with small annual plantings of Douglas fir and Macrocarpa. All stands have been established with the best quality seed stock available and have been pruned and thinned to produce high quality sawlogs and peelers to maximise the value and the market opportunities of timber produced.